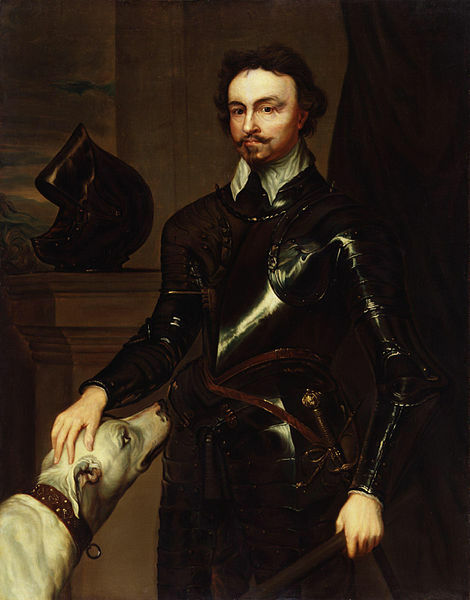 Sir Thomas Wentworth, 1st Earl of Strafford, was King Charles I’s leading and most able adviser in the period that just preceded the English Civil Wars. But he became a scapegoat for Parliament’s many grievances against the Church and State, condemned to death and executed. How could a man who had risen so high fall so low? And how could the King let this happen? He certainly regretted it and Strafford’s death will weight heavy on his conscience until his dying day. Described by his contemporaries as a man of, “deep policy, stern resolution and ambitious zeal to keep up the glory of his own greatness”*, and “severe abroad and in business, and sweet in private conversation; retired in his friendships but very firm; a terrible judge and a strong enemy”**, Wentworth, a member of an old Yorkshire family, was born in London, went on to study at St John’s College in Cambridge and then became a law student at the Inner Temple. In 1614, he was elected for the first time to Parliament as MP for Yorkshire but would politically oppose the Duke of Buckingham (and thus the King). After Buckingham’s death, Wentworth asserted his loyalty to the crown and was made by the King a viscount. He was also appointed Lord-President of the Council of the North in December 1628, dealing efficiently but ruthlessly with the Northeners who defied his authority, thus establishing his reputation as an efficient administrator. The next year he was appointed to the Privy Council. In 1633, he became Lord Deputy of Ireland, a land that had fallen into chaos. Wentworth managed to put some order in the country by securing firm control over the army and manipulating the Irish Parliament. He also introduced measures to develop trade. However, he exercised his powder in a harsh, autocratic and despotic way. He promoted the interests of the Protestant settlers over those of the Catholic natives and raised and introduced new taxes. When he went back to England in 1639, he was appointed Lord-Lieutenant of Ireland***, created First Earl of Strafford and became Charles I’s leading adviser. During this time, the King was at war with Scotland. He was losing it but was determined to keep fighting till the end. But for that, he needed more money. Money that only Parliament could grant him. It was Strafford who convinced the King to summon what would be known as the Short Parliament in the spring of 1640 to raise more war funds. But Parliament wanted peace with the Scots and for the King to finally address the many grievances they had against the Church and State. So, Strafford went to Ireland where he made the Irish Parliament come up with the money and raise an army that would help the King against the Scots. Strafford convinced the King that other means could be employed to raise an English army, which, coupled with the Irish forces would defy the Scots. And so, the King dissolved Parliament. But the new English army was defeated before the Irish one could come to its aid. 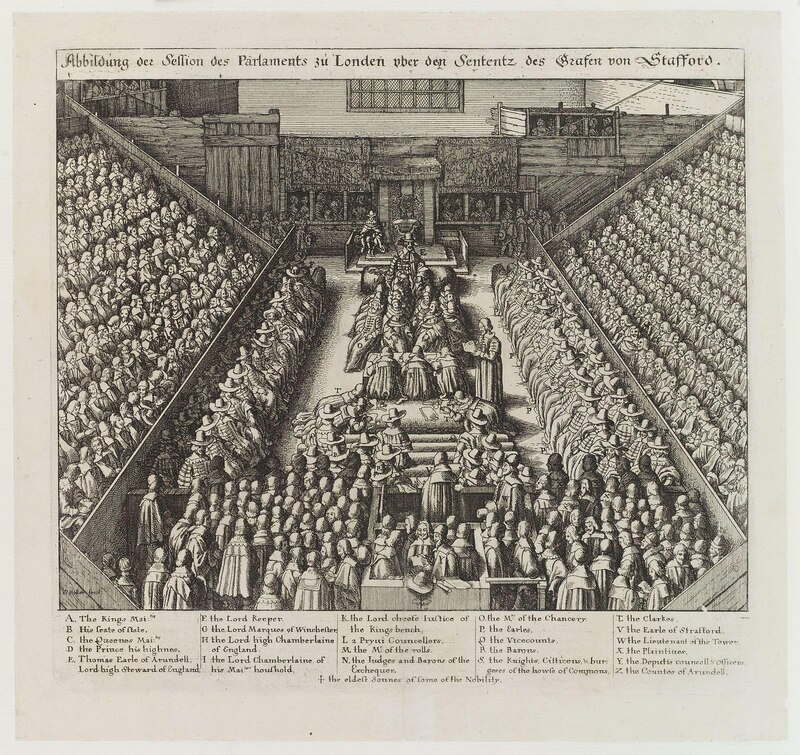 This forced Charles I to summon what would be called The Long Parliament in November 1640. 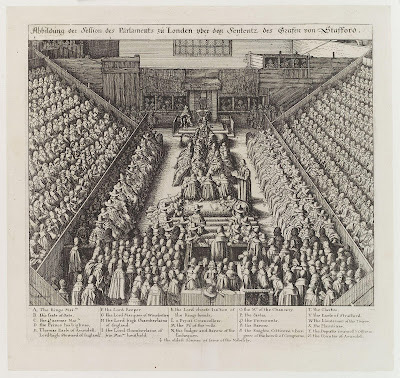 When the King summoned Strafford to London to attend Parliament he promised him that “upon the word of a king, you should not suffer in his person, honour or fortune.” The King may have meant that but Parliament had other plans. One of its first actions was to impeach Strafford. The Earl was nicknamed “Black Tyrant Tom” and accused of advising the King to use the Irish army he had raised against the English people. Strafford was arrested and taken to the Tower on 31 January 1641. But it was on 22nd March 1641 that the trial started. The trial was attended by both the King and The Prince of Wales, but while the latter sat at his place in full regalia, the throne was empty. Charles I took a place in one of the boxes in order to remain incognito. But the Earl didn’t need the King’s help in this trial. The accusations were so weak they couldn’t be proven and Strafford defended himself so ably that he positively influenced the judges in his favour. The impeachment failed. But Parliament was determined Strafford should die and so the House of Commons produced a bill of attainder against him. A bill of attender is an act declaring someone guilty and punishable without the benefit of a trial. In this case, it meant that Strafford could be killed simply because Parliament wanted him dead, even if he hadn’t done anything wrong. But Strafford was a member of the House of Lords and this House of Parliament had the power to block the bill. But Strafford wasn’t hated only by Parliament. The people of England couldn’t stand him either and the House of Lords was afraid the mob would become violent should they do anything to stop the bill. The only thing needed now was the King’s signature. But Charles was very reluctant to sign the Bill. Strafford was his chief minister and had served him loyally. On the other hand, not signing it could have seriously threatened the monarchy. Maybe even the Queen. Seventeenth-century England was very anti-Catholic and even Queen Henrietta Maria, herself a Catholic, was threatened by the people. In the end, it was Strafford who released the king. He wrote to His Majesty: “I do most humbly beseech you, for the preventing of such massacres as may happen by your refusal, to pass the bill; by this means to remove… the unfortunate thing forth of the way towards that blessed agreement, which God, I trust, shall for ever establish between you and your subjects.” On 10th May, Charles I reluctantly consented to the Bill. But the King did make a last, desperate attempt to save his faithful servant. The next day, he sent his son Charles, Prince of Wales, then only nine-years old, to the House of Lords to deliver a message. 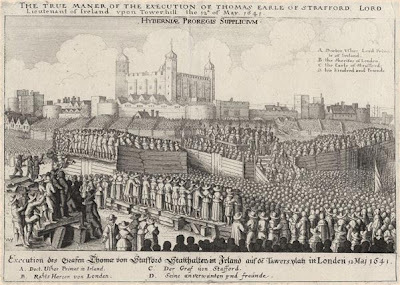 The King asked whether Strafford could be imprisoned for life instead than executed and added that, if this could be done with the consent of the people, he’d be very happy. But if not, then “Fiat Justitia”. In this case, though, the King’s message finished, “it were charity to reprieve him until Saturday”. But it was all in vain. 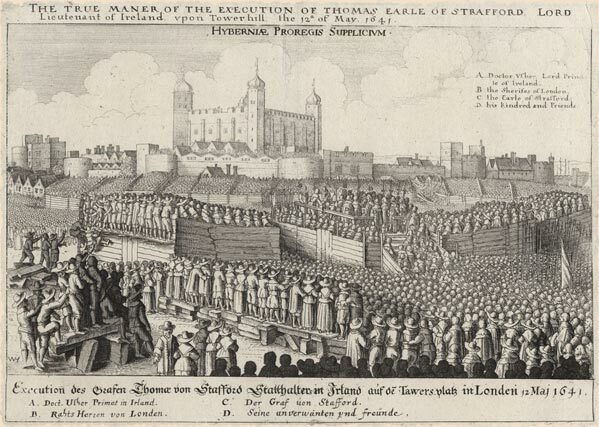 The next day, 12th May 1641, Strafford was executed on Tower Hill, in front of 20,000 people. The King never forgave himself for thus betraying Strafford. His death always remained on his conscience. He later became convinced that what he had suffered during the Civil Wars and his own death sentence were God’s punishment for letting his adviser die. What’s certain is that politically, considering what a capable adviser Strafford was, his death was a mistake. And like William Laud, Archbishop of Canterbury, observed, it surely wasn’t honourable either “(Straffird died with) more honour than any of them will gain which haunted after his life”.